ISHR provides both analytical and practical information to human rights defenders and other people wishing to follow developments within the human rights bodies and mechanisms at the international, regional and national level. We monitor a broad range of UN sessions and other human rights mechanisms, which enables us to produce timely updates shortly after the meetings end. Sign up to receive our publications by e-mail, free of charge! Reports relating to events prior to 2003 will soon be available in the Archive, which is still under construction. Our flagship publication, the Human Rights Monitor Quarterly, aims to inform and support human rights defenders in their engagement with international and regional human rights systems, by providing relevant and timely information on key developments and opportunities. The publication was launched in April 2010, and replaces the former annual Human Rights Monitor, Council Monitor, New York Monitor, Treaty Body Monitor, and UPR Monitor publications. It is issued in late January, April, July and October each year. The publication presents a global picture of key developments in the international and regional human rights systems. It also highlights events, meetings, and opportunities for NGO/NHRI engagement in the upcoming quarter and beyond. See the current edition of the Human Rights Monitor Quarterly here. 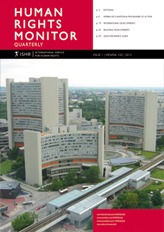 Beginning in January 2010, ISHR will move to a quarterly publication format to replace the New York Monitor, Treaty Body Monitor, UPR Monitor and Council Monitor publications. The first edition of the Human Rights Monitor Quarterly will be published in mid-April 2010, followed by editions in mid-July and mid-October 2010. The fourth edition will be incorporated into ISHR’s annual Human Rights Monitor, updated to include events from October to December 2010. The April 2010 edition of the Human Rights Monitor Quarterly will include articles on the 45th session of the Committee on the Elimination of Discrimination against Women, the 76th session of the Committee on the Elimination of Racial Discrimination and the 98th session Human Rights Committee, the 4th session of the Advisory Committee, the 7th session of the UPR and the 13th session of the Human Rights Council. The Quarterly will also include an article on regional developments and upcoming activities, as well possible additional articles from New York on the Security Council and Peacebuilding Commission. The Quarterly will also include a new section on issue-specific developments within the international or regional human rights systems, a calendar of upcoming UN and regional events, and a listing of forthcoming opportunities for NGO/NHRI engagement in the coming quarter and beyond.